We’re delighted to bring you a snapshot of these stories and, to kick things off, who better than the people we do all of this for – the students. When ISTA came to our school, I had such an enjoyable time. Every activity was fun and I got to make new friends with people I didn’t know that well before. ISTA grew my imagination and confidence. I specifically remember how much fun it was when we got to share what we had been learning with other students at the end of the week. To sum it all up, ISTA was an extremely pleasant experience that I’d love to do again. Our group of 22 were sweating when we departed Singapore but freezing when we arrived in Moscow, Russia. It was a big leap for us to adjust from 29ºC to -16ºC. Regardless of the temperature, it was the warmth of the hospitality and culture that we were brought into which created the long-lasting memories we left with. Our school trip to the ISTA Moscow middle school festival was a learning experience of a lifetime. 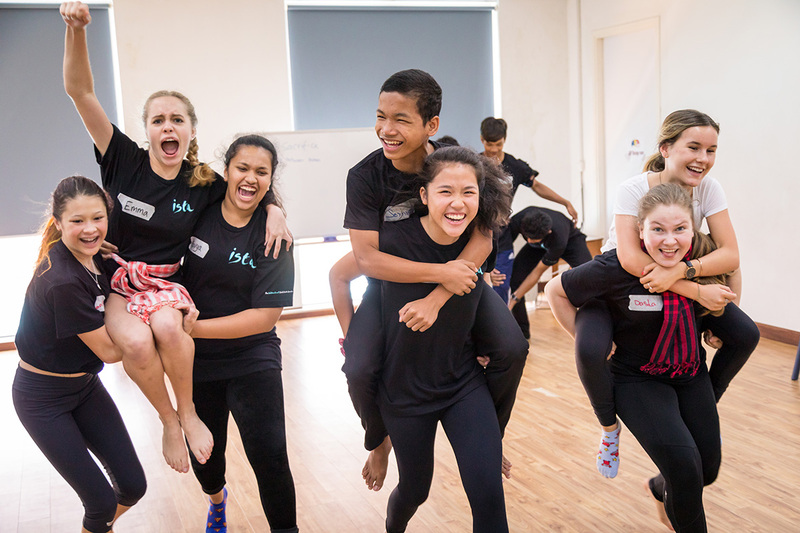 As young drama enthusiasts, we were immersed in Russian culture, drama workshops and fun activities which you wouldn’t be able to do in Singapore (cough cough: snowball fights). I was thrilled to be one of the five lucky boys from 8th grade to be selected. I auditioned on 28th September 2015 which was pretty close to the start of school. And by November I was shopping for winter jackets and snow boots in sunny Singapore. While this year’s ISTA was full of returning 7th graders, it was my first time. In fact, the whole trip was just a collage of first time experiences for me. We left at the stroke of midnight on 25th January 2016 and arrived 15 hours later in Moscow. I remember vividly how all of our tired, jet-lagged eyes instantly turned awake at the first sight of snow. It was the first time I had ever seen or felt real snow. Our teacher chaperones Ms. Dowd and Ms. Fulcher’s thoughtfully planned itinerary took us straight to the Red Square where we saw the iconic Kremlin and St. Basil’s Church, and ended our long day with an amazing night of ice-skating. I hilariously slipped on my face each day after that. And – thanks to modern technology – it was all recorded. After three days of touring with our awesome guide, we reached the Anglo-American School of Moscow. At the theatre festival, I added more first time experiences to my list, such as being hosted by a local family, hanging out at a Russian mall – and above all – showcasing a final performance we made from scratch and perfected in just three days. We learned the important skill of working with others and coming out of your comfort zone. We were also taught skills in improvisational acting, character development, physical acting and projection. Our final performance was a combination of what we brought with us and what we learned during the festival. ISTA is all about teaching us the importance of life experiences. Just from one trip, I had about 20 new challenges and encounters. ISTA is all about putting yourself out there and showing the world who you can truly be. I am very grateful to my parents and all my teachers who believed in me and supported me to help make this trip possible. Our chaperones Ms. Fulcher and Ms. Dowd provided us with affection, care, humour and memories for us to bring home. The starting point for the festival was Out of this world. It means your acting and drama can tell stories that are far away from our planet: stories that can even be beyond our solar system. You just need to grab life as it comes and put yourself out there. Share passionately and welcome the opportunities for firsts in your life. It’s all about trying something new. ISTA was all about the experiences I had with old and new friends, snow, language, culture and food. To me, it meant learning new things about myself, taking on life as it comes and enjoying the ride. Looking back at who I was before this trip I would never be able to fathom the idea that in eleven days my whole world could be shaken up and turned upside down. As a frequent traveller I, of course, was looking forward to visiting London and Prague, but it almost felt as if the time we were going to spend in Terezin was left in the shadows and pushed to the back of my mind. Well, what an experience to underestimate. I could tell you about the seven-ish days we spent sightseeing in two of the most beautiful cities in the world and how seeing Europe, and exploring theatre with my closet friends, was magical and in itself easily one of the best weeks of my life. But why not tell the story of three days in the dirtiest and most disturbing city I have ever visited? Why not tell the story of how I met the most incredible students from around the world and connected to these artists on a deeper level in three days than one could ever even dream of? When we arrived at Terezin, I was completely in the dark on what this experience would hold and to be quite honest sad because after the bright lights and stunning architecture of London and Prague I was underwhelmed with the blandness of this small town. We ate dinner in the dining hall clumped together in our familiar school group and tried to inconspicuously eye the other schools to see who they were and what they were like but within hours after dinner the common room on the first floor was filled with students from our school, Vienna, Portugal and Russia. The energy was tangible and the smiles contagious as we played games and shared stories, and from this moment on there was never a dull moment. Over the next few days I would be moved to tears, lose and gain my faith in humanity, be filled with hope, shocked to the bone and, most importantly, discover what it means to create and how this creation gives our lives meaning and purpose. Of course I will never forget walking on the same cobblestones that the Nazis and prisoners had, and touching the crumbling walls where hundreds and thousands of Jews were trapped and murdered but I know for a fact that the moments I spent in a deserted and dusty gym working with my ensemble group will always stick out in my mind. Rolling around on the floors of the dark gym and exploring my body as a catalyst for developing stories into art, I learned that my responsibility as an artist is to share what I have seen and felt with the world around me. This being said, imagine four groups of roughly twenty students joining together and all sharing the same realisations and discovering the same truths. How powerful an image this was and what a way to celebrate and honour the thousands of Jews that were stripped of their lives and creations in the Terezin Ghetto. I cannot express enough how valuable this experience has been in not only shaping my life as a theatre artist but giving me direction to lead myself into the future with a new purpose and appreciation for this beautiful ability to really, truly, live. This experience will forever be a burning image in my mind and soul, and will be an experience I will cherish and celebrate for the entirety of my being. The only way I can think to conclude this reflection is with a quote I saw while visiting one of the museums in the ghetto: “To create, is to live” and nothing was more apparent on this journey in Terezin. My recent participations at the ISTA TaPS in New York were incredible experiences which have proven beneficial in my theatre education. The artists at ISTA TaPS were all clearly experienced and really helped me to explore my interests in theatre. As someone who loves theatre in school but feels like there is never enough time in the classroom, it was so refreshing to have entire days to focus on the subject and to be able to practice and refine what I had learned. We had time to really workshop what we were learning from both our ensemble leader and master class leaders, and to get an actual feeling for specific areas/genres of theatre rather than just a theoretical understanding. Being in a space with peers who shared the same interests as myself was also great as I felt very comfortable sharing my ideas and putting these ideas into action. I came out of the event much more confident because of all the exercises intended to get me out of my comfort zone. I was able to see that failure is just a step on the path to success due to the ample amount of class time we were given to learn and practice ideas. This confidence has carried over to my life outside of theatre as well as I am no longer scared to fail. Since TaPS I have begun to contribute more in theatre class and have truly began to see and experience theatre from different perspectives. Despite a severe typhoon warning for Hong Kong, our plane departed Melbourne. The next morning the warning was still in place and we were informed that we were required to stay in our hotel and our Hong Kong colleagues were likewise unable to leave their homes. So, stranded in our hotel and unable to get to our workshop space as the palm trees outside swayed alarmingly, we began the weekend with a bleak view of our workshops actually proceeding. However, ISTA was not to be thwarted. With the support of our accommodating hotel staff we were provided with a room. A meeting room barely a body length wide, dominated by a huge oblong table. No problem. Despite limited space, our Kathakali workshop leader, artist and teacher Fenella Kelly, spread her displays down one end of the table and stood on the other. Kathakali is a highly physical theatre practice involving the whole body. True to form body awareness and peripheral vision kicked in and we were soon stamping our feet, circling our arms and attempting some of the complicated hand gestures, the mudhras. No one could say we weren’t using the space to its maximum potential. International theatre companies rarely tour outside of the festival circuit so it can be difficult in Australia to attend live performances of Kathakali theatre. We were fortunate as Fenella is one of the few Westerners to train and perform in the Kathakali style. She performed the role of Krishna in the Gopalakrishna temple in Kerala in full costume and makeup for her Kathakali Arangettam, her first Kathakali performance and initiation into the Kathakali community. This meant she was able to give us first-hand knowledge of the weight of the costumes, the process for applying makeup and insights into the mindset required when undertaking the arduous training. Of particular interest to me was her demonstration of the complicated meanings conveyed by combining the mudhras. I had only ever experienced them through a book and hadn’t realised the complicated meaning that can be conveyed when they are combined. She was able to take what we had experienced as basic vocabulary and transform it into storytelling. The trip would have been justified if this was the only workshop I attended. The next morning, a glorious day greeted us as we headed by bus to the Hong Kong Academy. Here we met our Hong Kong colleagues who’d been unable to travel the day before. In true theatre-teacher style we all took the opportunity to network with our counterparts and ask specific questions regarding assessment criteria and interpretation. Our workshop was on the IB Theatre course with Dinos Aristidou. We were delighted with the practical games, focused explorations and strategies for devising theatre and exchanged resource material. We plunged into joyful, open hearted creativity – the only way to be with Dinos. Throughout the experience we were reminded of what we expect from our adolescent students – instant ability to ignore self-consciousness. It wasn’t easy but Dinos kept us focussed and on task, despite our occasional subversive tendencies. While here at the Academy I had the opportunity to witness the excitement and engagement of the students attending TaPS. It was clear that exposure to other IB students and participation in the professionally run workshops was beneficial. They spoke frequently of sharing knowledge with fellow IB students from a variety of schools and countries, and were aware that they were very much a part of an international community. The students were generous in their praise and demonstrated a determination to apply the new skills acquired. This is what makes the ISTA experience rewarding. The recognition that one is not working alone in the theatre space, in a world that often seems to value creativity as a useful asset in the quest for product innovation rather than the expression of place and person. Despite typhoons and the tyranny of distance, we experienced the vital community of theatre. The opportunity to share time with like-minded individuals who share a passion for theatre is an opportunity not to be missed. An opportunity which ISTA provides.